Being an American that has never traveled overseas to Europe makes researching t he production of pointe shoe brands in that region quite an exotic and brain-stimulating experience. I feel a bit like Christopher Columbus sailing around making discoveries once hidden from the rest of us, but now no longer a secret. So far on the sidebar links we have brands from Italy, Germany, France, England, Spain, Holland and Austria. Now, we have another country to add; The Czech Republic and the Ditas brand name. 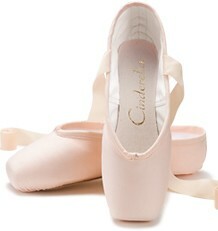 I am thrilled to find a Czechoslovakian pointe shoe brand. 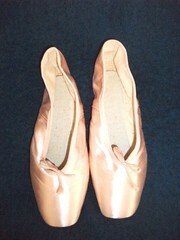 A well-worn pair of Ditas pointe shoes. Although faded, the Ditas logo is still visible. Wanted dead or alive: a collectors dream. 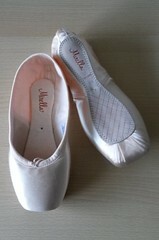 This dancewear company is located in the heart of Prague. 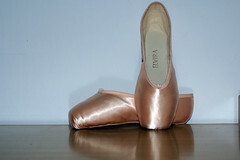 They began production of their garments and shoes in 1991. According to their About Page, they supply many theatrical venues in and around the country; including The National Theatre of Prague. 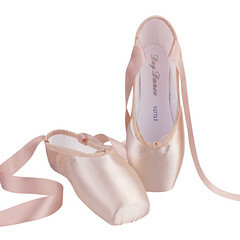 It appears that Ditas has one advertised model in pink satin, although the catalog mentions that they take custom orders for shoes in beige, black or white. 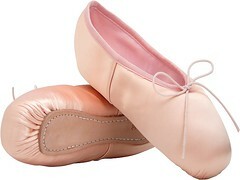 Although I am slightly disappointed about the lack of specifications on their pointe model, it hasn’t burst my discovery bubble. I searched high and low for any social media accounts for Ditas, but couldn’t find any. You can find their interesting product catalog on their official website, Ditas.cz. 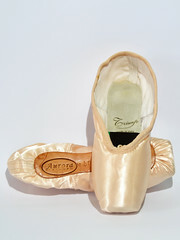 This entry was posted in Czechoslovakian Brands and tagged Czechoslovakian pointe shoe brands, Ditas pointe shoes, pointe shoes made in Czech Republic. Bookmark the permalink.